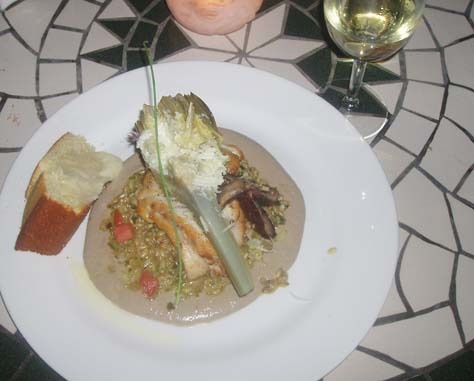 If you are going to Key West and looking for a great place to dine, you must try Blue Heaven restaurant. 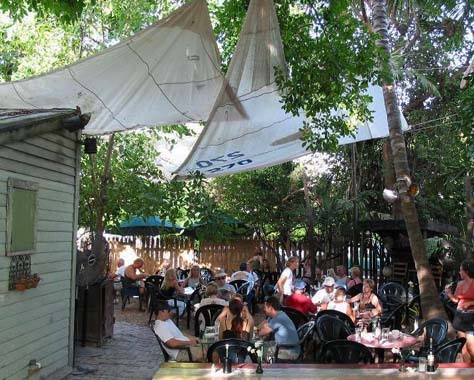 Located on Petronia Street, in the middle of a residential neighborhood, there is a place that is so magical that to call it a restaurant seems like an insult. When you walk in, you immediately understand why it is called Blue Heaven. You are transported into a different world, where banyan trees provide ceiling and curtains, fairy lights are hung from the trees, and real sails are strung across the branches above your head. Founded by two artists in 1992, each table is topped with hand painted tiles in vibrant shades from sunflowers to paisley designs. It feels as if you are walking into a different land, where roosters and well fed cats patrol the grounds and the stage that Ernest Hemingway used to referee cockfights at in the 1930’s may be hosting a performance from a local Improv troupe, as it was the night my mother and I were there for dinner. My mouth waters writing this, remembering watching the steaming bowl make it’s way to the table. A soup so delicious it’s hard to believe it doesn’t have some sort of meat stock, there are thick chunks of carrots along with the beans and the whole thing is topped with fresh chopped scallions, shredded sharp white cheddar cheese, and sour cream. My mothers’ salad had crisp romaine, sprouts, carrot, avocado, and some tomato along with the optional gorgonzola ($1.50) and orange cider vinaigrette. 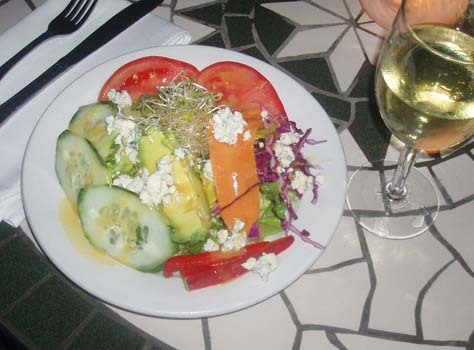 I tried some, and it was splendid, the acidity in the dressing perfectly complementing the creaminess of the gorgonzola and the avocado and the crunch of the other veggies. I managed to catch some of the Improv troupe’s performance as I snuck in a quick cigarette in between courses. It was a little hard to follow, but definitely interesting. A quick walk around the building revealed the open kitchen around the back, the upstairs of the main building now a gallery only used for dining space in the event of inclement weather still has sliding peephole doors leading to small rooms from when the space once housed a bordello. Returning to see our entrees gracing the table, I was careful not to trip on a root or in between the rough Chicago brick walkways. 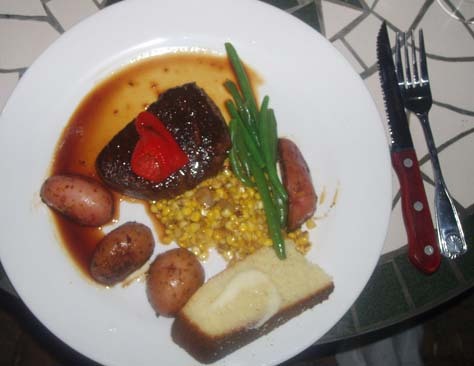 My Eight Ounce Filet with Cabernet Demi Glace ($38) was served with freshly baked cornbread, herbed red potatoes, and haricot verts. A single strip of roasted red pepper adorned the perfectly seared filet, which was executed at an exact medium rare. Save Room for the Best Key Lime Pie Ever! Only because we are Blue Heaven vets did we manage to stop ourselves from finishing our dinners to save room to share dessert. Having heard great things about the other desserts has never swayed us from ordering the Key Lime Pie, served with a cloud of Meringue so high it seriously looks like a piece of heaven on a plate. Neither too sweet nor too sour, the graham cracker crust is crumbly and divine, exactly the kind of dessert that makes you forget how much you have already eaten. You can read more about Ricky’s Blue Heaven, including the fact that they were recently rated the #1 restaurant in the U.S on Yahoo Travel, at blueheavenkw.com. You can also check out their blog. 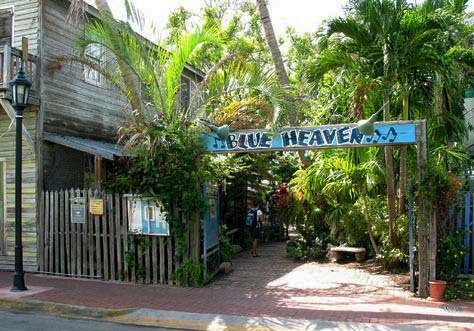 Blue Heaven is technically located at 729 Thomas street, although it’s entrance is on Petronia and that is most likely the route you will take to get there next time you go to Key West. Enjoy! See more articles by Rebecca Lucente.